I loved The Waking Fire, the first book of this series – it sent me into an Anthony Ryan binge and I read his previous series as well (review coming eventually). I was glad that I’d read it so close to the release date of the next book so I didn’t have to wait too long to find out what happens next. The Legion of Flame picks up pretty much where The Waking Fire left off and continues to follow Lizanne, Clay, and Hilemore. Lizanne is back home and is immediately sent on a spy/peace mission to the Corvantine Empire. Clay and Hilemore are still in Arradasia and are voyaging to the South Pole in an attempt to figure out how to save the world from the increasingly more likely dragon apocalypse. We also have some new PoV characters that provide more insight into the White dragon’s plans, I won’t say more about them to avoid spoilers. I always find it hard to review sequels since (usually) pretty much everything about the first book applies to the sequel as well and I wouldn’t be reading the book at all if I hadn’t liked the first book. The Legion of Flame definitely expands the world, we see Mandinor and more of the Corvantine Empire (we do still have some insight into what’s happening in Arradasia though the new viewpoints). We learn more about dragons, their origins, and the history of the world, which I thought was pretty cool. I had some guesses about that and I was glad to see them vindicated. My favorite plotline in the book was probably Lizanne’s, her mission has a very Escape from New York vibe to it and it’s fun to see her badassery grow. Clay and Hilemore get the more interesting worldbuilding though, and I liked that each of the viewpoints told a different kind of story. There are also some in-universe newspaper articles, etc. at various points, and I always enjoy those. 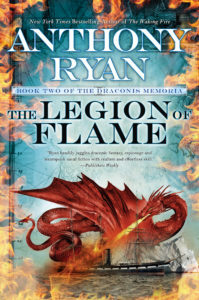 Overall, I thought The Legion of Flame was a solid sequel. However it does end on a cliffhanger, so I’m impatiently waiting for book 3. This entry was posted in Books, Reviews and tagged book 2, fantasy, fiction, steampunk by Kriti Godey. Bookmark the permalink.